Eggs in Clouds: whipped egg whites with chives and a mix of Italian cheeses makes a delicious fluffy base for these eggs. 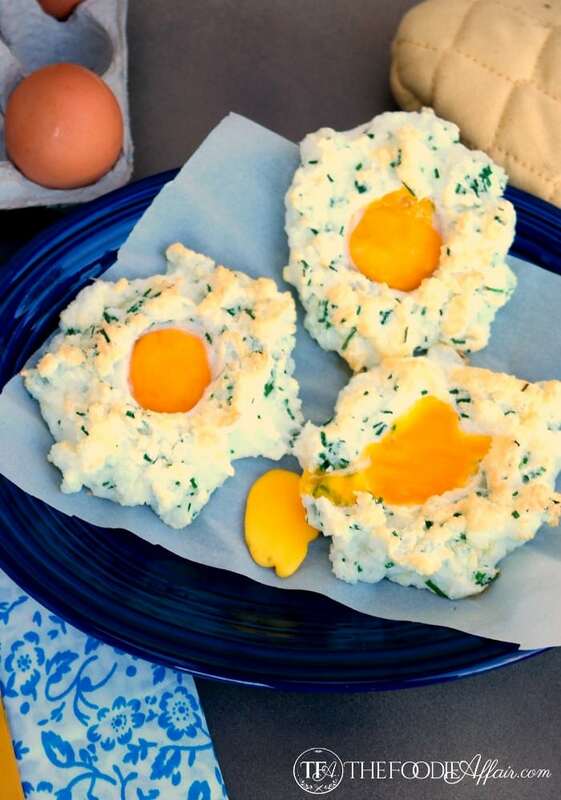 At first sight, Rachael Ray’s Recipe looked like eggs nestled in drop biscuits and I almost passed by them when I was searching for something to make for breakfast, but then I saw the ingredients and thought how clever! These light, flavorful pillows are egg whites! Just my kind of meal, simple, healthy, and delicious! Rachael added chopped chives and bacon to her egg whites, but I decided that little bacon nibbles wouldn’t do. Since bacon and eggs are the dynamic duo I couldn’t completely do without the bacon, so I served it on the side instead. In fact, I cooked the whole package and we managed to eat every slice! These eggs are simple enough to enjoy any weekend and the presentation is so lovely, I would also serve these for a special occasion! Keep this recipe in mind for the next time you have house guests, or are hosting a special event like a wedding or bridal shower. 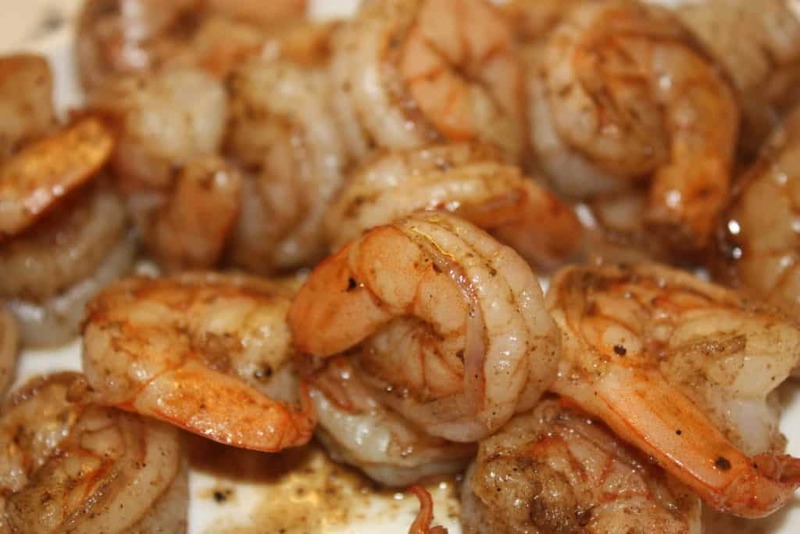 This recipe is perfect for feeding a crowd! 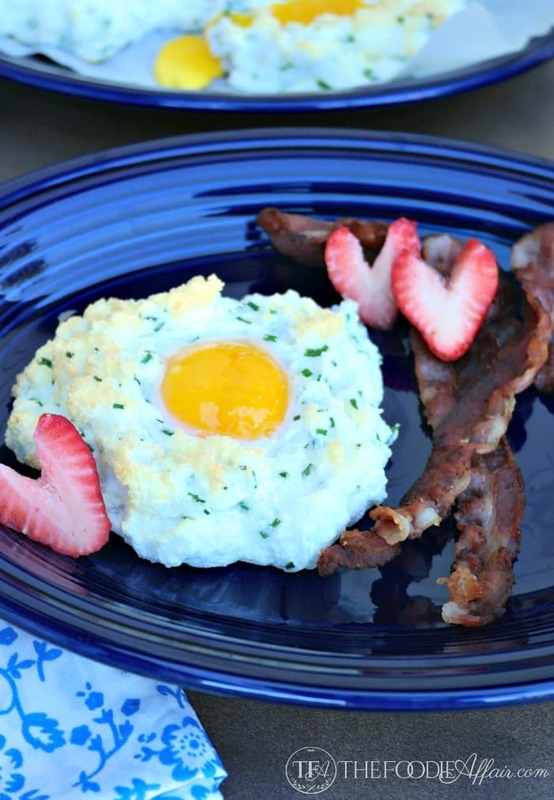 This would also make an amazing morning breakfast for your valentine! Ohhh, yes! Make these for your sweetheart and be sure to cut out heart strawberries too! Light and fluffy whipped eggs baked, then add the yolk for a perfect brunch meal for a crowd. Preheat oven to 450 degrees. Line a baking sheet with parchment paper and set aside. Carefully separate the yolks and egg whites. Keep the yolks whole and put them in separate small bowls. In a large bowl, whip egg whites until stiff peaks form (about 5 minutes). Fold in cheeses and chives. Spoon four mounds of the egg whites placing them on the prepared baking sheets. Form a well in the center of each mound large enough to hold the yolk, but don't add the yolk yet. Bake egg whites for 3 minutes. Place yolk in the center of the mounds and bake for an additional 2 minutes. Remove from oven and gently remove from parchment paper. Serve with bacon. These are so different! Love this idea! I think all the ingredients are perfect together and such a fun presentation! Wow! Those are beautiful and they sound absolutely delicious!! These look so simple and so good! I love this idea, Sandra! I’m always looking for new and exciting high protein breakfasts and this is definitely one I want to try! Thanks so much for sharing!! I am going to try this for my Moms Meeting breakfast. Thank you so much! I hope this will be mom approved 🙂 Thank you, Susan! This looks delish and they look so pretty too. Clever and fun to make! I love this recipe, I am a big fan of adding chives into my eggs! Love these eggs, they’d be perfect for brunch. Fun idea. Very neat way to serve. So fun, imaginative and YUM! I’ve never seen anything like this before, and I LOVE it!! Looks so amazing! What a great idea! I think my kids would especially love these. Fun! I’ve always wanted to try this, looks delicious & like my kind of breakfast!!! This looks delicious! I’ve never tried eggs in clouds. These have been on my to-make list for a long time – thanks for inspiring me. Would make for a hearty breakfast! Thanks for the recipe. Wow this recipe would be perfect for guests! They’re so pretty and sound delicious! What a great idea! Perfect for brunch! 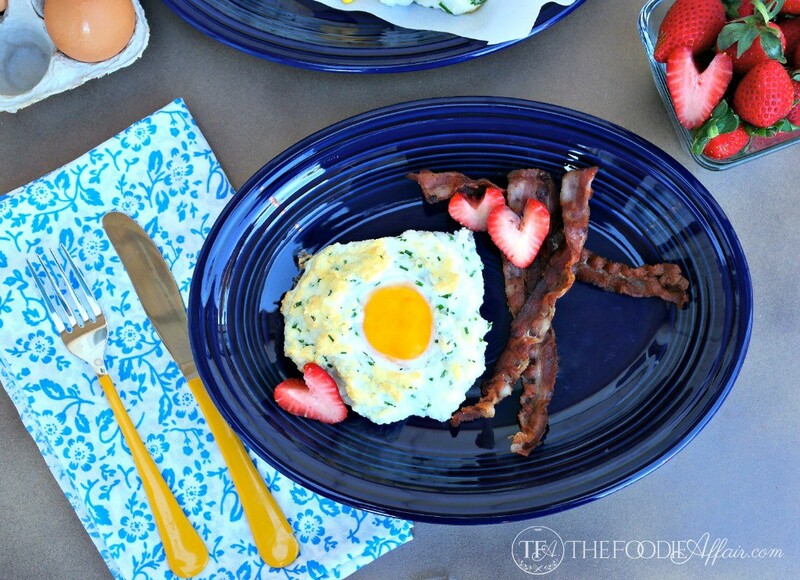 These eggs sound perfect for breakfast this week. I love how light and delicious they look. I made these for us this morning. It was easy and so delicious! Thank you for anohter amazing recipe! Awesome! So glad you enjoyed this new way of cooking eggs! Love the chives in these! This is a great, simple and healthy recipe! Thank you, Brandi. The chives add a nice flavor to what are otherwise bland egg whites! 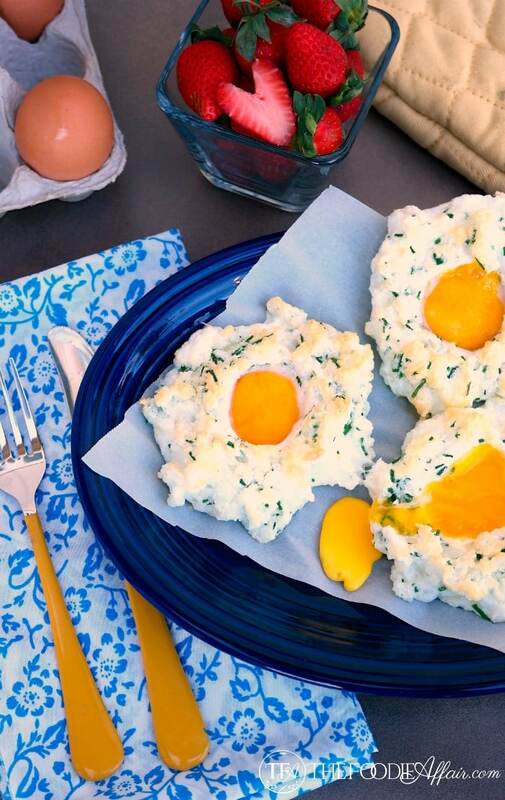 Such an inventive way to serve eggs! Brooks loves his well done and he scarfed these up in a hurry! It’s a easy and delicious meal for special occasions like brunch-time!